Now that I have you signing along with me, I'm excited to share with you a project using images from Boardwalk, the latest release from Artistic Outpost. For my first project, I used SVG Cuts Summer Holiday Kit, cutting the Suitcase pieces from Brown card stock and KaiserCraft Pattern Paper using the Silhouette Cameo. The images are stamped in Ranger Coffee Archival on White card stock, then colored with a combination of STAEDTLER Karat Aquarell Watercolor Pencils and Ergo-Soft Pencils, blending the colors with Gamsol. My card uses a left over piece of MonoPrinting that I created with some Acrylic Paints and the Gelli Arts Printing Plate. The houses were masked and stamped in Ranger Black Archival on the mono printing. The "bathing beauties" were stamped in Black Archival on White card stock and colored with STAEDTLER watercolor pencils. 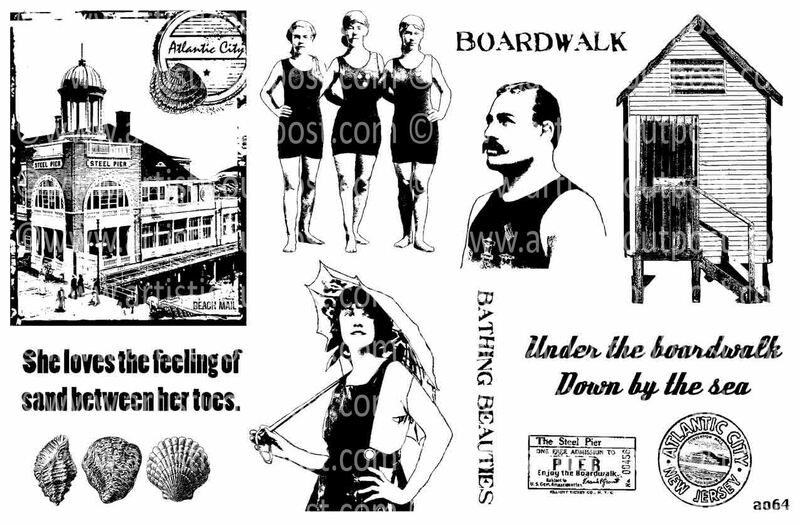 The Boardwalk plate features the Atlantic City historic boardwalk, along with an ATC sized collage of the Steel Pier. This plate also includes other fun summertime images, and is available in both unmounted and precut/mounted on EZMount cling, in the Artistic Outpost store. To celebrate this release, and the upcoming days of summer, from now through June 8th, 2013, you can save 15% on all Artistic Outpost rubber stamps! No coupon code is required, the discount will be reflected in your shopping cart. This is a wonderful set!!! I love the theme, and the ladies are wonderful! Your cards are just gorgeous...love the backgrounds! Adorable tiny case... just love the weatherbeaten look, and the images pop brilliantly within the black frames - fabulous! Just love what you've created with these stamps. Fantastic! Sensational, Lisa! That suitcase is totally awesome! Love how you have used these wonderful images! Your suitcase rocks GF! I got such a big smile from that FAB piece of art, great card too. Lisa, that suitcase has me drooling! Love how you combined the images and sentiment and your card is gorgeous! Such fun! I Love that suitcase! It looks so worn and beaten! 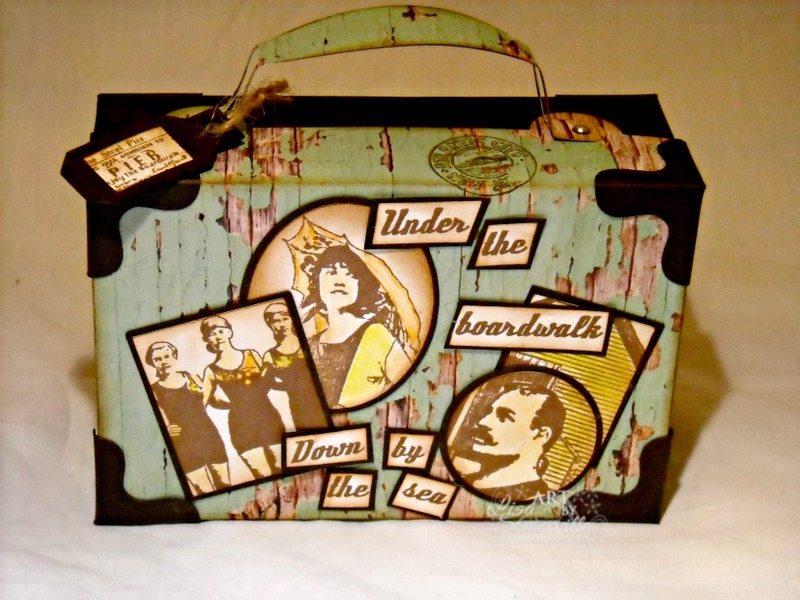 The perfect vintage valise for those images. And your card is fabulous!! Yep, I am singing along...! Love the suitcase- and the card too. Another great set of images from AO! Gorgeous suitcase! I have been singing that song everytime I play with the stamps! 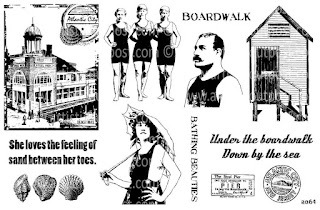 Love how you used the distressed paper in the background and added all the fun images from the boardwalk set. The girls on the beach are lovely! Cool background! 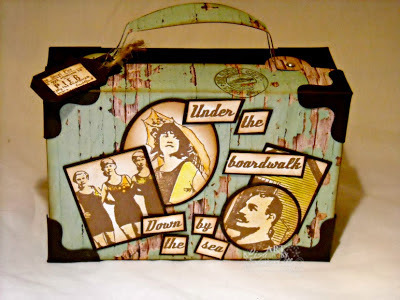 Brilliant use of these stamps, the suitcase is fabulous all worn, wonderful, the card is gorgeous, the beach houses and then the ladies stamped on top just amazing love the old vintage look, thanks for sharing and have a wonderful creative day.. Thanks for all the fun and inspiration. Neat projects. rally like both of these--clever idea with the suitcase and love the houses in your scene.